SiM3U1xx and SiM3C1xx include current mode digital-to-analog converter (IDAC) module. The IDAC takes a digital value as an input and outputs a proportional constant current on a pin. 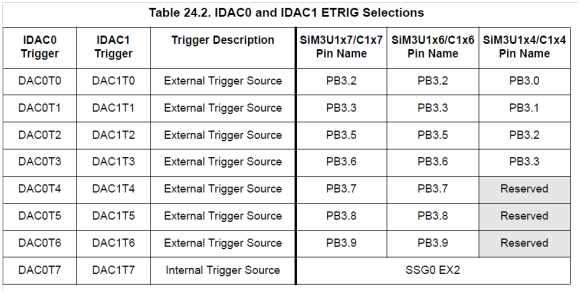 The IDAC module includes the following features: 10-bit current DAC with output update trigger source options. Support for three full-scale output mode: 0.5, 1.0 and 2.0mA. Four-word FIFO to aid with high-speed waveform generation or DMA interactions. 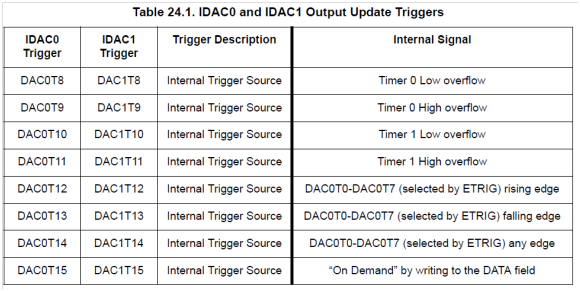 Ability to update on rising, falling, or both edge for any of the external I/O trigger sources (DACnTx). 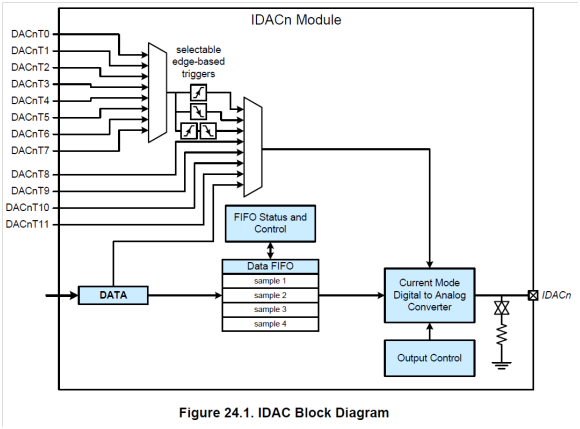 The various IDAC features and modes are enabled using the CONTROL register. There are four different modes: on-demand mode, periodic FIFO wrap mode, period FIFO-only mode, and periodic DMA mode. The IDAC full scale current output is configured using the OUTMD bit field. There are nominally 2.046, 1.023 and 0.5115 mA. Optionally, and on-chip load resistor can be enabled by setting the LOADEN bit. This enables an impedance path to ground which effectively produces a voltage at the output pin. 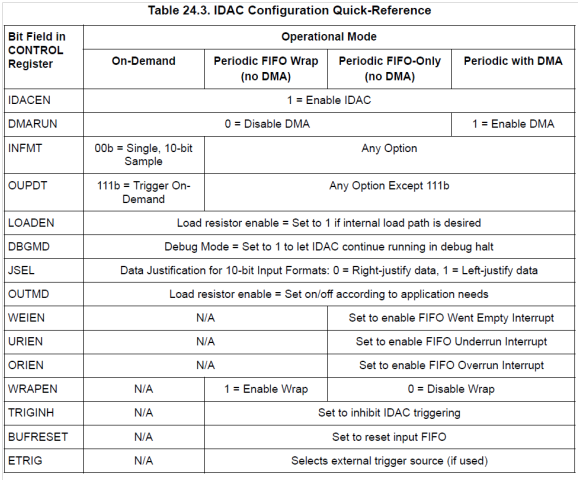 IDAC conversions can be triggered “on-demand” with a write to the DATA register, or periodically using one of the internal timer options or external conversion trigger inputs. We can have a look on below table for quick-reference on IDAC operation. 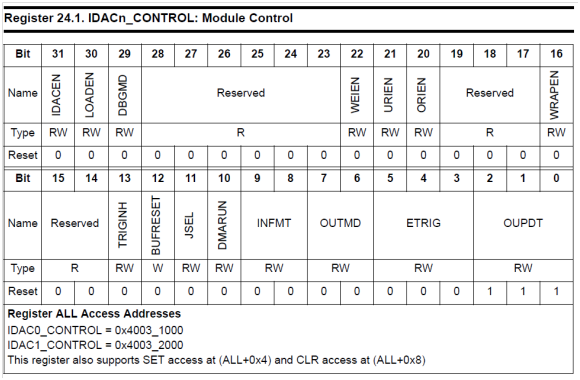 That is very useful for setting up IDAC correctly. 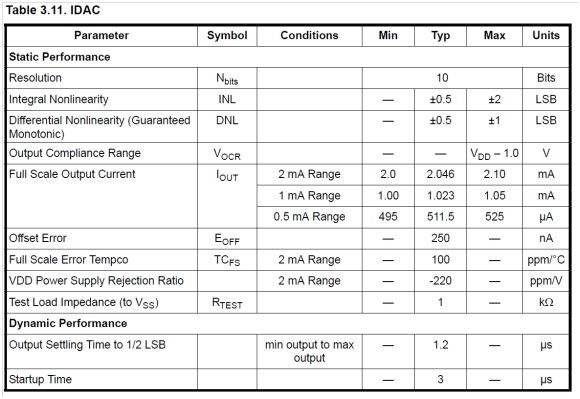 And here we have a look on IDAC electrical parameters in below table. We used AppBuilder to generate basic code we need, and then added necessary code to make temperature sensor works. 1. Use HP 34401A Multimeter, select DC current measurement function. Connect wires to MCU CARD IDAC0(PB0.13) pin(in "ANALOG" area) and GND. 2. Connect a wire to PB3.2 pin with series-connected 1K resistor, we will connect another ends of the wire to generate falling edge event. 4. Run the code and use HP 34401A Multimeter observe the IDAC0 output constant current. For On-Demand mode, we can see output current value update in console windows in IDE every 2 seconds; For other modes, we need generate P3.2 falling edge event by pulling down voltage level, we can observe that output constant current change at each falling edge.